Professor Bishop is a health economist who applies microeconomics to policy-related problems in health services supply, demand, and financing. 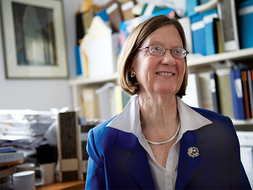 Her studies in long-term services and supports (LTSS, also called long-term care) and Medicare post-acute services have been concerned with both provider and recipient behavior, considering costs, production efficiency, payment, financing, and utilization of nursing homes and home health services. Her current research concerning the LTSS workforce builds on her training as a labor economist and early research and publications on nursing labor markets. She has led or co-led evaluations of delivery system and payment innovations, developed policy analyses concerning long-term and post-acute utilization and payment, and carried out econometric analyses using data derived from national sample surveys, administrative data, and project data collection. Bishop, C. E., J. G. Hefele, R. Kaur and S. C. Miller. "Adoption of Resident-Centered Care Practices: Impact of Nursing Home Financial Resources. Report.." 11/20/2017. Bishop, C. E. and J. G. Hefele. "Integrating Post-Acute Care: Progress of Relational Contracting between Accountable Care Organizations and Post-Acute Providers." Industry Studies Association, Washington, DC. May 25, 2017. Bishop, C. E., J. G. Hefele, J. Perloff and R. Mechanic. "Accountable Care Organizations And Post-Hospital Care For Older Adults: Coordination And Costs." International Association of Gerontology and Geriatrics, San Francisco. 7/27/2017. Bishop, Christine E. "Statement On Proposed Regulation 105 CMR 158.000, Licensure of Adult Day Health Programs.." Testimony presented to Massachusetts Department of Public Health.. August 4. Bishop, Christine E. "Statement on 130 CMR 404.000 Adult Day Health Services,." Testimony presented to MassHealth Hearing on Eligibility Requirements for Adult Day Health. Worcester MA. 10/6/2017. Hefele, J. G., J. Wang, A. Barooah and C. E. Bishop. "Factors Associated With Quality Improvement In Light Of Changing Payment Sources In Nursing Homes.." International Association for Gerontology and Geriatrics, San Francisco. 7/25/17. Hefele, Jennifer Gaudet Ritter, Grant A Bishop, Christine E Acevedo, Andrea Ramos, Candi Nsiah-Jefferson, Laurie A Katz, Gabrielle. "Examining racial and ethnic differences in nursing home quality." The Joint Commission Journal on Quality and Patient Safety 43. (2017): 554-564. Kaur, Ramandeep, Jennifer Perloff, Christopher Tompkins, Christine E Bishop. "Hospital Postacute Care Referral Networks: Is Referral Concentration Associated with Medicare-Style Bundled Payments?." Health Services Research 52. 6 (2017): 2079-2098. Stone, R., Wilhelm, J., Bishop, C.E., Bryant, N.S., Hermer, L. & Squillace, M.R.. "Predictors of Intent to Leave the Job Among Home Health Workers: Analysis of the National Home Health Aide Survey." The Gerontologist 57. 5 (2017): 890-899. Bishop, Christine E. Testimony on 101 CMR 310.00: Adult Day Health Services MassHealth Payment Rate. Massachusetts Executive Office of Health and Human Services. 2016. Jennifer Gaudet Hefele, Andrea Acevedo, Laurie Nsiah-Jefferson, Christine Bishop, Yasmin Abbas, Ecaterina Damien, and Candi Ramos. "Choosing a Nursing Home: What Do Consumers Want to Know, and Do Preferences Vary across Race/Ethnicity?." Health Services Research 51. Suppl 2 (2016): 1167-1187. Bishop, Christine E & Robyn Stone. "Implications for policy: The nursing home as least restrictive setting." The Gerontologist 54. Supplement 1 (2014): S98–S103. Bishop, Christine E. "(2013). An Economist Looks at LTSS: Old Challenges, New Opportunities. Comments on Symposium: Long-Term Care in 1988 and 2013: Same or Different? Presented at the." Gerontological Society of America Annual Meeting. New Orleans, LA.. 11/20/13. Bishop, Christine E. "High-performance workplace practices in nursing homes: An economic perspective." The Gerontologist 54. Supplement (2014): S46-S52..
Bishop, Christine E. "Nursing Home Closures 2004-2014:Preliminary Findings." Board of Directors, Massachusetts Senior Care Association. Newton Massachusetts. April 2. Bishop, Christine E. "The Commission on Long Term Care: Search for a Consensus Policy Space." Board, Massachusetts Senior Care Foundation,. Newton Lower Falls, MA. 10/2/13. Bishop, Christine E. Statement Prepared for Presentation to Department of Public Health on Proposed Regulation 105 CMR 158.000, Licensure of Adult Day Health Programs. Massachusetts Division of Health and Human Services. 2014. Staff, Commission on Long Term Care. Report to the Congress. 2014. Bishop, Christine E. "Expanding the capacity to treat older adults with mental health and substance use conditions: A workforce policy strategy." Public Policy & Aging Report 23. (2013): 16-19. Bishop, Christine E. "The Commission on Long Term Care: Search for a Consensus Policy Space." Health and Aging Policy Fellowship Annual Leadership Retreat.. Washington, D.C. 9/24/13. Bishop, Christine E.. "PPACA and Long-term Services and Supports (LTSS) Direct Care Workforce." Labor and Employment Relations Association Annual Meeting. Denver. January 6, 2011. Christine E. Bishop . "Homecare Services for Disability: Evolving Markets." Industry Studies Association Annual Meeting. Pittsburgh. June 2, 2011. Christine E. Bishop . "Testimony: 114.3 CMR 10.00 Adult Day Health Services." Massachusetts Division of Health Care Finance and Policy. Boston. February 24, 2011. Christine E. Bishop, Cindy Parks Thomas, Daniel Gilden. "Early Results: Beneficiary-Centered Assignment: Dimensions and Impacts." Health Care Financing and Organization Briefing. Washington D.C.. December 8, 2011. Christine E. Bishop, Daniel Gilden, Angelina Tong Lee, Cindy Parks Thomas. "Impact of Part D Transition on Dually Eligible Medicare Beneficiaries." Gerontological Society of America Annual Meeting. Boston. November 20, 2011. Christine E. Bishop, Jennifer Meagher, Jennifer Perloff. "The Nursing Home as Setting for Chronic Illness Care: Risk of Ambulatory Care Sensitive Hospitalization." Seminar Series, Rosalie Wolf Interdisciplinary Geriatric Healthcare Research Center At Umass, University of Massachusetts at Boston. February 14, 2011. Christine E. Bishop. "Statement Prepared for Presentation to Work Group on Adult Day Health Services, Public Comment." Massachusetts Division of Health and Human Services. November 8, 2011. Christine E. Bishop, Daniel Gilden, Cindy Parks Thomas	, Joanna Kubisiak. Enrollment of Dually Eligible Beneficiaries in Medicare Part D Plans: Autoassignment and Choice. Submitted to Centers for Medicare and Medicaid Services under CMS Task Order Proposal (RTOP) No. CMS-04-016/VAC: Evaluation on Medicare Modernization Act Changes on Dual Eligible entitled: Evaluation of Medicare Modernization Act Changes on Dual Eligib: 2010. Christine E. Bishop, Jennifer Meagher, Jennifer Perloff, Galina Zolotusky. Event Analysis of All-Cause and Ambulatory Care Sensitive Hospitalization of Long-Stay Nursing Home Residents. Centers for Medicare and Medicaid Services Final Report: Nursing Home Resident Beneficiaries for CMS Contract No. HHSM-500-2005-000201/T.O. 0001: Adverse Events Among Chronically Ill Beneficiaries: Variations by Geographic Area, Organization of Practice: 2010. Christine E. Bishop, Jennifer Perloff, Jennifer Meagher, Grant Ritter, Walter Leutz. "Evaluation of the Medicare Low Vision Rehabilitation Demonstration." Presentation to Centers for Medicare and Medicaid Services. Baltimore MD. July 13, 2010. Christine E. Bishop, Jennifer Perloff, Jennifer Meagher, Grant Ritter, Walter Leutz. Evaluation of the Low Vision Rehabilitation Demonstration: Claims Analysis. Baltimore MD Centers for Medicare and Medicaid Services (CMS) Contract No. 500-00-0031: 2010. Daniel Gilden, Christine E. Bishop, Angelina Lee, Cindy Parks Thomas. Disruptions of Continuity: Duals Enrolled in Part D, 2006-2007. Submitted to Centers for Medicare and Medicaid Services under CMS Task Order Proposal (RTOP) No. CMS-04-016/VAC: Evaluation on Medicare Modernization Act Changes on Dual Eligible entitled: Evaluation of Medicare Modernization Act Changes on Dual Eligib: 2010. Daniel Gilden, Christine E. Bishop, Angelina Tong Lee, Cindy Parks Thomas. "Transition to Part D: Impact on Dually Eligible Medicare Beneficiaries." Poster Presentation AcademyHealth Annual Research Meeting, Boston. June 28, 2010. Daniel Gilden, Christine E. Bishop, Angelina Tong Lee, Cindy Parks Thomas. Impact of Part D Transition on Dually Eligible Medicare Beneficiaries. Submitted to Centers for Medicare and Medicaid Services under CMS Task Order Proposal (RTOP) No. CMS-04-016/VAC: Evaluation on Medicare Modernization Act Changes on Dual Eligible entitled: Evaluation of Medicare Modernization Act Changes on Dual Eligib: 2010. Jennifer Perloff, Jennifer Meagher, Christine E. Bishop, Christopher Tompkins. Time to Readmission among Chronically Ill Community-Resident Beneficiaries: Variations by Geographic Area and Provider Type. Centers for Medicare and Medicaid Services Final Report, Nursing Home Resident Beneficiaries, for CMS Contract No. HHSM-500-2005-000201/T.O. 0001: Adverse Events Among Chronically Ill Beneficiaries: Variations by Geographic Area, Organization of Practice: 2010. Leutz, W., Bishop, C. E., Dodson, L.. "A Labor-Management Partnership for Person-Centered Care in Nursing Homes: A Case Study ." International Conference on Evidence Based Policy in Long-term Care, London School of Economics. London. September 9, 2010. Walter Leutz, Christine E. Bishop, Lisa Dodson. "A Role for a Labor-Management Partnership in the Transformation of Nursing Homes to Person-Centered Care." The Gerontologist 50. 2 (2010): 340-351. Bishop, C. E., C. P. Thomas, D. Gilden and J. Kubisiak. "Enrollment of Dually Eligible Beneficiaries in Medicare Part D Plans: Autoassignment and Choice." AcademyHealth Annual Research Meeting, Chicago IL. June 29, 2009. Bishop, Christine E, Walter Leutz, Lisa Dodson. "Workplace Restructuring for Nursing Home Quality of Life: Case Study of a Labor-Management Partnership to Transform Work and Care." Industry Studies Association Annual Meeting, Chicago, IL. May 29, 2009. Bishop, Christine E. "Dimensions of Retirement Insecurity in an Economic Downturn: Causes and Options." Session organizer and chair. Named as Policy Series Symposium. Gerontological Society of America Annual Meeting. Atlanta GA. November 21, 2009. Bishop, Christine E. "Individual Choices for Long Term Services and Supports." Eisenhower Strategy Forum: Aging in America--Financing Senior Care from a “Micro” Perspective. Boston MA. October 8, 2009. Bishop, Christine E. "Learning from Low Vision Rehabilitation Claims. Symposium:Evaluation of the Medicare Low Vision Rehabilitation Demonstration." Gerontological Society of America, 2009 Annual Meeting, Atlanta GA. November 21, 2009. Bishop, Christine E. "Private Financing of Long Term Services and Supports in Massachusetts." Massachusetts Long-Term Care Financing Advisory Committee. June 18, 2009. Christine E. Bishop, Andrew Ryan, Daniel Gilden, Joanna Kubisiak, Cindy Parks Thomas . "Effect of an Expenditure Cap on Low-income Seniors' Drug Use and Spending in a State Pharmacy Assistance Program ." Health Services Research 44. 3 (2009): 1010 - 1028. Christine E. Bishop, Marie Squillace, Jennifer Meagher, Wayne Anderson, Joshua Wiener. "Nursing Home Work Practices and Certified Nursing Assistants' Job Satisfaction." The Gerontologist 49. 5 (2009): 611-22. Christine E. Bishop. "The Looming Economics of Health Care for an Aging Society ." Presented at Brandeis University "Aging Well: It's Not Too Soon". April 3, 2009. Bishop, Christine E. . "Get What We Pay For: Public Payment, Private Markets, and Elder Services." Session Organizer and Chair, Gerontology Society of America Annual Meeting , Washington, DC. November 24, 2008. Christine E. Bishop, Cindy Parks Thomas, Daniel Gilden, Joanna Kubisiak. "Enrollment of Dually Eligible Beneficiaries in Medicare Part D Plans: Autoassignment and Choice." Presented at the Gerontology Society of America Annual Meeting , Washington, DC. November 22, 2008. Christine E. Bishop, Dana Beth Weinberg, Walter Leutz, Almas Dossa	, Susan Pfefferle, Rebekah Zincavage. "Nursing Assistants' Job Commitment: Effect of Nursing Home Organizational Factors and Impact on Resident Well-being." The Gerontologist 48. Special 1 (2008): 36-45. Christine E. Bishop, Walter Leutz, Lisa Dodson. "Transitioning Nursing Homes to Person-Centered Care: Role for a Labor Management Partnership." Poster Presentation AcademyHealth Annual Research Meeting, Washington. June 2008. Christine E. Bishop. "The Looming Economics of Boomer Health Care." Boomer Bust? Economic and Political Dynamics of the Graying Society. vol. Volume 1 Ed. Robert B. Hudson. Westport CT: Greenwood, 2008. 95-109. Chrstine E. Bishop, Andrew Ryan, Daniel Gilden, Cindy Parks Thomas, Joanna Kubisiak, Donald Shepard. " Medicare Savings due to Prescription Drug Coverage for Near-poor Elders." Oral Presentation, Academy Health Annual Research Meeting, Washington. Selected as Best Abstract (one of 3). June 8, 2008. Jody Hoffer Gittell, Dana Weinberg, Christine Bishop, Susan Pfefferle. "Impact Of Relational Coordination On Job Satisfaction And Quality Outcomes: A Study Of Nursing Homes." Human Resource Management Journal 18. 2 (2008): 154-170. Bishop, Christine E. , Walter Leutz, Deborah Gurewich, Marian Ryan, Cindy Parks Thomas. Medicare Special Needs Plans: Lessons from Dual Eligible Demonstrations for CMS, States, Plans, and Providers. Centers for Medicare and Medicaid Services. 2007. Christine Bishop, Walter Leutz, Lisa Dodson, Rebekah Zincavage. "A Labor-Management Partnership for Person-Centered Care in Nursing Homes: A Case Study ." Presented at the Quality Care Conference. New York City. December 13, 2007. Christine E. Bishop. "Prescription Drugs and Elders in the Twenty-first Century." Challenges of an Aging Society: Ethical Dilemmas, Political Issues. Ed. Rachel A. Pruchno, Michael A. Smyer. Baltimore: Johns Hopkins University Press, 2007. 420-436. Christine E. Bishop, Andrew Ryan, Daniel Gilden, Melissa Morley, Joanna Kubisiak, Cindy Parks Thomas. "Effect of Soft Cap on Low-income Seniors' Drug Use and Spending in a State Pharmacy Assistance Program ." Presented at AcademyHealth Annual Research Meeting (one of 3 best abstracts, Coverage and Access division). Orlando, FL. June 5, 2007. Christine E. Bishop, BJBC Team. "Nursing Assistants¿ Experience of Supervision: Effect on Job Commitment and Impact on Resident Well-being." Presented at the Annual Meeting of the Gerontological Society of America. San Francisco. November 17, 2007. Christine E. Bishop, Better Jobs Better Care Team. "Nursing Assistants' Job Commitment: Effect of Nursing Home Organizational Factors and Impact on Resident Well-being." Presented at the Carework Conference (American Sociological Association). New York City. August 9, 2007. Christine E. Bishop. "Statement Concerning Medicaid Payment for Adult Day Health Services." Presentation to Division of Health Care Finance and Policy On 114.3 CMR 10.00 Adult Day Health Services. November 13, 2007 . Walter Leutz , Christine Bishop, Lisa Dodson. A Labor-Management Partnership for Person-Centered Care in Nursing Homes: A Case Study . Final Report to The Commonwealth Fund. 2007. Walter Leutz, Christine E. Bishop, Lisa Dodson. "A Labor-Management Partnership for Person-Centered Care in Nursing Homes: A Case Study ." Presentation to Pioneer Network Conference, Minneapolis. August 3, 2007. Walter Leutz, Deborah Gurewich, Cindy Parks Thomas, Marian Ryan, Bishop, Christine E. . Evaluation of Impacts of Medicare Modernization Act Changes on Dual Eligible Beneficiaries in Demonstration and Other Managed Care and Fee-For-Service Settings Final Report on Task 5: Examination of the Changing Context for Dual Demonstration Contracto. Centers for Medicare and Medicaid Services. 2007. Slayter, E. M., Garnick, D. W., Kubisiak, J. M., Bishop, C. E., Gilden, D. M., Hakim, R. B.. "Injury prevalence among children and adolescents with mental retardation." Ment Retard 44. 3 (2006): 212-23. Bishop,Christine E. "Paid Home Care in the 21st Century: Need and Demand." Home Health Care Management and Practice (HHCMP) (2005): 350-359. Christine E. Bishop. "Paid Home Care in the 21st Century: Need and Demand." Home Health Care Management and Practice (HHCMP) 16. 5 (2004): 350-359. Bishop, C.E.. "Chronic and Long-term Care Needs of Elders and Persons with Disability." Long-term Care and Medicare Policy: Can We Improve the continuity of Care?. Ed. Blumenthal, D., Moon, M., Warshawsky, M, Boccuti, C.. Washington, DC: National Academy of Social Insurance, 2003. 12-39. Bishop, C. E., Gilden, D., Blom, J., Kubisiak, J., Hakim, R., Lee, A., Garnick, D. W.. "Medicare spending for injured elders: are there opportunities for savings?." Health Affairs 21. 6 (2002): 215-23. Bishop, Christine E, Walter Leutz, Lisa Dodson. "Workplace Restructuring for Nursing Home Quality of Life: Case Study of a Labor-Management Partnership to Transform Work and Care." Industry Studies Association Annual Meeting, Chicato IL. May 29, 2009. Bishop, C.E., Kerwin, J., Wallack, S.S.. "The Medicare Home Health Benefit: Implications of Recent Payment Changes." Care Management Journals 1. 3 (1999): 189-196. Bishop, C.E.. "Efficiency of Home Care: Notes for an Economic Approach to Resource Allocation." Journal of Aging and Health 11. 3 (1999): 277-298. Christine E. Bishop, Joanne Kerwin, Stanley S. Wallack. "The Medicare Home Health Benefit: Implications of Recent Payment Changes." The Journal of Long Term Home Health Care 18. 3 (1999): 189-196. Christine E. Bishop. "Where are the Missing Elders? The Decline in Nursing Home Utilization, 1985-1995." Health Affairs 18. 4 (1999): 146-155. Bishop, C.E., Visconti, M.. Impact of Expedited Review under Certificate of Need for Home Health Services: Final Report to the State of New Jersey. Institute for Health Policy, Heller School, Brandeis University. Waltham, MA: 1998. Bishop, C.E.. "Health Cost Containment: What it Will Mean for Workers and Local Economies." Public Health Reports 113. 3 (1998): 204-13. Bishop, C.E.. The Cost-Adjustment Factor in the Rate-Setting Method for Medicaid Nursing Home Facilities. Testimony before the Massachusetts Commission on Health Care Finance and Policy. 1998. Bishop, C.E., Brown, R.S., Phillips, B., Ritter, G., Skwara, K.C.. "An Interim Solution for Medicare Home Health Payment - Response." Health Affairs 16. 2 (1997): 262-263. Brown, R., Phillips, B., Bishop, C., Thornton, C., Ritter, G., Klein, A., Schochet, P., Skwara, K.. "The effects of predetermined payment rates for Medicare home healthcare." Health Serv Res 32. 4 (1997): 397-414..
Bishop, C. E., Brown, R. S., Phillips, B., Ritter, G., Skwara, K. C.. "The home health visit: an appropriate unit for Medicare payment?." Health Aff (Millwood) 15. 4 (1996): 145-55..
Bishop, C. E., Wallack, S. S.. "National health expenditure limits: the case for a global budget process." Milbank Q 74. 3 (1996): 361-76. Bishop, C.E. , Wallack, S.S.. "National Health Expenditure Limits: The Case for a Global Budget Process." Milbank Quarterly 74. 3 (1996): 361-376. Bishop, C.E., Altman, S.H., Shactman, D.. Effects on Employment of a Deceleration in Health Spending. Institute for Health Policy, Heller School, Brandeis University, for the Council on the Economic Impact of Health Care Reform. Waltham, MA: 1996. Bishop, C.E., Brown, R.S., Phillips, B., Ritter, G., Skwara, K.C.. "The Home Health Visit: an Appropriate Unit for Medicare Payment?." Health Affairs 15. 4 (1996): 145-55. Wastila, L, CE Bishop. "The influence of multiple copy prescription programs on analgesic utilization." Journal of Pharmaceutical Care and Pain and Symptom Control 4. 3 (1996): 3-19. Wastila, L.J., Bishop, C.E.. "The Influence of Multiple Copy Prescription Programs on Analgesic Utilization." Journal of Pharmaceutical Care in Pain and Symptom Control 4. 3 (1996). Kumar, AKN, M Cohen, CE Bishop, S Wallack. "Understanding the factors behind the decision to purchase long-term care insurance." Health Care Services Research 29. 6 (1995): 653-678. Bishop, Christine E, Avi Dor. "Medicare costs in urban and rural nursing homes: Are differential payments required." Inquiry 31. 2 (1994): 153-162. Phillips, B. R., Brown, R. S., Bishop, C. E., Klein, A. C., Ritter, G. A., Schore, J. L., Skwara, K. C., Thornton, C. V.. "Do preset per visit payment rates affect home health agency behavior?." Health Care Financ Rev 16. 1 (1994): 91-107..
Pizer, CM, AF Collard, CE Bishop. "Recruiting and employing foreign nurse graduates in a large public hospital system." Hospital and Health Services Administration 39. 1 (1994): 31-46. Bishop, Christine E., Kathleen Carley Skwara. "Recent growth of Medicare home health: Sources and Implications." Health Affairs 12. 3 (1993): 95-110. Abrahams, R, CE Bishop, W Hernandez. "Respite service delivery: Learning from current programs." Pride Institute Journal 3. 16-29 (1991). Bishop, C. E., Pollakowski, H. O., Weisbrod, G. E.. "Living with others as an alternative to nursing home use." J Appl Gerontol 10. 3 (1991): 274-92..
Bishop, CE, HO Pollakowski, GE Weisbrod. "Living with others as an alternative to nursing home use." Journal of Applied Gerontology 10. 4 (1991): 274-292. Bishop, CE, L Dubay. "Medicare patient access to posthospital skilled nursing facility care." Inquiry 28. 4 (1991): 345-356. Bishop, CE. "Features of lower-cost continuing care retirement communities: Learning from cost analysis." Journal of Housing for the Elderly 7. 1 (1991): 55-77. Bishop, C. E., Karon, S. L.. "The composition of home health care expenditure growth." Home Health Care Serv Quarterly 10. 1-2 (1989): 139-75. Cohen, M. A., Tell, E. J., Bishop, C. E., Wallack, S. S., Branch, L. G.. "Patterns of nursing home use in a prepaid managed care system: the continuing care retirement community." Gerontologist 29. 1 (1989): 74-80. Holahan, J., Dubay, L. C., Kenney, G., Welch, W. P., Bishop, C., Dor, A.. "Should Medicare compensate hospitals for administratively necessary days?." Milbank Q 67. 1 (1989): 137-67. Bishop, C. E.. "Use of nursing care in continuing care retirement communities." Adv Health Econ Health Serv Res 9. (1988): 149-62. Bishop, Christine E.. "Competition in the market for nursing home care." Journal of Health Politics, Policy and Law 13. 2 (1988): 341-360. Bishop, Christine E.. "Use of Nursing Care in Continuing Care Retirement Communities." Advances in health economics and health services research. Volume 9. Private-sector involvement in health care: Implications for access, cost, and quality. Greenwich, Conn. and London:, 1988. 149. Bishop, C. E.. "Living arrangement choices of elderly singles: effects of income and disability." Health Care Financ Rev 7. 3 (1986): 65-73..
Christine E. Bishop, Margaret Stassen. "Prospective reimbursement for home health care: Context for an evolving policy." Pride Institute Journal of Long Term Home Health Care 5. 1 (1986): 17-26. Carliss Y. Baldwin, Christine E. Bishop. "Return to Nursing Home Investment: Issues for Public Policy." Health Care Financing Review 5. 4 (1984): 43-52. Bishop, C. E.. "Commentary on Nursing Home Costs." Health Services Research 18. 3 (1983): 383-386. Lee, A. J., H. Birnbaum, and C. E. Bishop. "How Nursing Homes Behave: A Multiequation Model of Nursing Home Behavior." Social Science and Medicine 17. 23 (1983): 1897-1906. Birnbaum, H., A.J. Lee, C.E. Bishop, G. Jensen. "Why Do Nursing Home Costs Vary? The Determinants of Nursing Home Costs." Medical Care 19. 11 (1981): 1095-1107. Christine E. Bishop. "A Compulsory National Long-Term Care System." Reforming the Long-Term-Care System. Ed. James J. Callahan, Jr., Stanley S. Wallack. Lexington, Massachusetts: Lexington Books, D.C. Heath and Company, 1981. 61-94. Bishop, C. E., Plough, A. L., Willemain, T. R.. "Nursing home levels of care: problems and alternatives." Health Care Financ Rev 2. 2 (1980): 33-45. Christine E. Bishop. "Nursing Home Cost Studies and Reimbursement Issues." Health Care Financing Review 1. 4 (1980): 47-64. Bishop, C. E. . "Wage Setting Practices and Internal Wage Structure: The Hospital Case." Industrial Relations 16. 2 (1977): 26-34. Bishop, Christine E.. "Health Employment and the Nation's Health ." Current History May/June (1977): Reprinted in Eric Oatman, ed. Medical Care in the United States, New York: H.W. Wilson, 1978. Reprinted in Philip R. Lee, ed., Medical Science and the Nation's Health, San Francisco: Boyd and Fraser Publishing Co., 1981. .
Bishop, Christine E.. "Hospitals: From Secondary to Primary Labor Market." Industrial Relations 16. 1 (1977): 26. Bishop, Christine E.. "Manpower Policy and the Supply of Nurses." Industrial Relations 12. 1 (1973): 86-94.